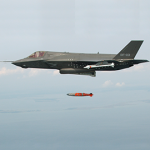 The United Arab Emirates will purchase laser guided bombs from Raytheon (NYSE: RTN) under a $684.4 million deal, Reuters reported Tuesday. The agreement announced at the Dubai Airshow Tuesday includes Raytheon-built GBU-10 and GBU-12 Paveway bomb kits. The deal came days after UAE awarded Lockheed Martin (NYSE: LMT) a potential $1.6 billion order to update the country’s fleet of F-16 fighter jets. UAE also received approval from the State Department in May to buy Patriot missile systems from Raytheon and Lockheed under a potential $2 billion agreement. The Middle Eastern country’s military also announced an artillery procurement agreement with Germany-based Rheinmetall and plans to ink a deal with Thales and Dassault to modernize its fleet of its 75 Mirage 2000-9 planes, the report added.